Daniel Turriccki broke the individual scoring record in a single game for Kettering Phoenix in their 103-78 victory at Riders Staff in Division One of the Leicestershire & Rutland League. Turriccki piled in 48 points to help Phoenix to their comfortable success. The men’s second team – the Suns – had a narrow 54-51 win over Ashby Aztecs B in Division Four with Nick Lander scoring 21 points and John Clarke adding 16. The third team – the Tropics – were also successful in Division Four as they beat St Matthews All Stars 75-64 with Romeo Rotaru (24) and Erlens Ters (17) being there leading scorers. Phoenix were also victorious in the Women’s Division as Tara Hings (16) and Courtney Gray (15) led them to a 69-45 success over Moat Flames. Phoenix’s youngsters had two wins, a draw and a defeat as they compete in an Under-13 Northants Tournament. They beat NEBC Titans Blue 7-6 before drawing 6-6 with Northampton Adders. Phoenix lost 4-0 to NEBC Titans Green but finished on a high note with a 12-4 victory over Duston Hawks. Hans Calaunan was the team’s top scorer with 15 points across the four games. NEBC Titans women enjoyed an 88-67 victory over Lancashire Spinners in Division Two, two weeks on from a disappointing performance against the same opponents. Paige Vyse was a handful for the Spinners’ defence as she converted her opportunities and Titans held a 20-9 lead at the end of the first quarter. Spinners fought back in a physical game but Titans were able to remain strong with the scoring spread between the team with Vyse, Lauren Milne and Frankie Patmore all reaching double figures. Lancashire Spinners were also the opponents for the U16 girls in the North Regional League and Titans maintained their unbeaten record with an 82-73 success. But they had to fight back from a 34-32 deficit at half-time as Ella McCahill-Brown showed fine form in the third period while Jess Lee found the basket. Titans outscored their opponents by 11 points in that quarter before the two teams cancelled each other out in the fourth. Titans U14 Girls made the short trip to take on Northants Lightning in the Midlands Regional League. Having beaten their opponents by one in their last meeting, they improved on that with a 66-47 success. The damage was done in the first half as Titans opened up a 43-11 lead with Imogene Williams proving to be unstoppable but it was some strong defensive play that took them to the win. Titans Purple were up against Northants Thunder in the U14 Boys Midlands West Regional League and secured an excellent 87-77 win. Thunder had the better of things in the first quarter and held a 26-17 lead but the balance of power shifted and Titans created some excellent scores to edge in front 42-41 at the end of the half. A combination of better defence and good fast-breaking resulted in Titans opening a 10-point lead after the third period and that set them up to clinch the win. Five of the young Titans reached double figures with 11-year-old Ethan Round leading the charge with 27 points while support came from Rayaan Khalid (14), Josh Broomhead (14), Ethan Mead (11) and Shay Doyle (11). Titans U14 boys’ first team travelled to take on Derby Trailblazers in the North Premier League and were just edged out 69-60. The first quarter was promising with Titans forcing several fouls from their hosts and they trailed by just three points and that gap remained the same at half-time. Trailblazers came out fighting in the third and although creating chances, Titans were unable to close the small gap and, instead, the advantage grew to 10 points. Captain Timmie Olubisi took control of his side and helped get Titans back to within four at the start of the final quarter. 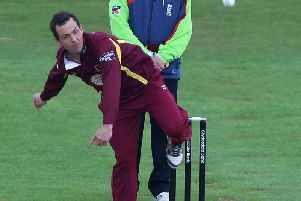 But time was no longer on Titans’ side and, despite Harry Holt pulling out all the stops, the hosts secured victory. Titans travelled to leaders Reading Rockets in the U16 Boys Central Premier League and, despite a battling display, they were beaten 100-52. Titans got into trading baskets early on through Isaac Round and Ben Hooper before Rockets hit them with a 9-0 run. Titans were just edged in the second and Rockets changed to a zone defence and that proved to be the turning point as the hosts poured in a 24-0 run to put the game out of sight. Free Throw errors cost Northants Thunder dear when they lost 67-62 to University of Nottingham in Division Four National League Midlands Conference. The Northants senior men missed out on the opportunity to take over top spot after slipping to defeat. Thunder did a great job in restricting the university team to just 67 points. But were let down by some appaling free-throw shooting which saw them miss 19 shots from the ‘charity stripe’. Jason Tucker top scored with 22 points and also pulled down a dozen rebounds. In the Under-16 Girls National League North Conference, the Cadette girls got back to winning ways with a 16-point victory over Hatfield Fliers in a low-scoring game. They ran out winners by 51-35 with Dina Kosnikovska and Lucy Needham leading the scoring with 18 and 11 points respectively. The Under-14 Boys National League Midlands West Conference saw local rivals Titans Purple win 87-77 against the Thunder. Thunder made an excellent start to the game jumping out to a 20-9 but could not hold on. The Thunder scoring was led by Tom Greenfield with 32 points. It was a similar outcome at the same age group when the local rivals in the Girls Midlands East Conference. In this case Lightning were beaten 66-47 by Titans. The under-13 girls were another side to suffer a loss as they were went down 67-59 to County Upper Wolves. Keris Ndubisi did her best scoring 18 points in a losing cause.